Kidwells House01432 270313work Guest AccommodationKidwells House licensed accommodation is Hereford’s largest Guest House with 20 rooms and is designed to make your stay relaxing and enjoyable. We offer a fantastic variety from Standard to Superior rooms, including Superior Balcony, Courtyard, Double and Family. Here at Kidwells House all rooms have flat screen, Freeview TV, hairdryer and full tea and coffee making facilities. We also offer Complementary Wi-Fi. We have a large secure and safe car park with storage for bicycles, large lawned gardens to sit and unwind in, a relaxing sunny conservatory lounge, modern dining facilities and superbly presented rooms all close to local amenities and just a short walk from the historic centre of Hereford and it’s Cathedral. At Kidwells House we offer a wonderful breakfast experience in our modern dining room. Breakfast is served between 7 and 9 am every day. Choose from our hot & cold buffet which includes a full complement of cereals, fruit and juices. As well as our freshly cooked ingredients for a full English breakfast, we also cater for special diets including Vegetarian and Gluten Free options. . Please ask us for more details to suit your needs. We can also provide packed lunches or a light snack in the evening upon prior booking and offer a range of chilled drinks including wines and beers for you to purchase throughout your stay. Whether it’s for business, holiday or pleasure, Kidwells House gives you everything you need for a perfect stay. Kidwells House licensed accommodation is Hereford’s largest Guest House with 20 rooms and is designed to make your stay relaxing and enjoyable. We offer a fantastic variety from Standard to Superior rooms, including Superior Balcony, Courtyard, Double and Family. 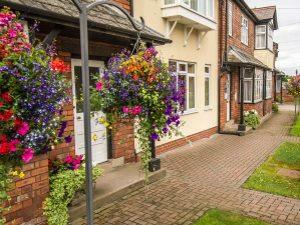 Situated 1/4 mile from the railway and bus/coach station. Walk out of the station bearing left up to the traffic lights and turn right into Commercial Road. Walk halfway up the road until you come to a Chinese restaurant on the right called The Palace. Turn right and then take the second left into Coningsby Street. First right into Widemarsh Street and continue down to the roundabout. First exit left and we are on the left hand side. Coming south into Hereford on the A49 from Shrewsbury/Leominster. Straight over the roundabout, pass the Leisure Centre on your right. Bear left at the mini- roundabout and straight over the second roundabout into Newtown Road, where we are 100 yards on the right.